Roosevelt Institute researcher says student-loan program is "a failed social experiment." But you already knew that. Julie Margetta Morgan and Marshall Steinbaum wrote a blockbuster of a report for the Roosevelt Institute on the student-loan crisis. Unfortunately, the bland title and multiple graphs obscured the authors' key finding, which is this: Contrary to what student-loan advocates proclaim, a great many people who took out student loans for postsecondary education have not seen a rise in wages. As author Julie Margetta Morgan summarized, "We've essentially engaged in a failed social experiment where the government thought that it would be fine to give people student debt because it would pay off in the long run and we're seeing that's not the case." "More education has not led to higher earnings over time." Although the higher education community trumpets the myth that rising student debt and more education leads to higher income, that is not true. Instead, "the distribution of earnings in the labor market has remained relatively unchanged over time. And to the extent that individuals see an income boost based on college attainment, it is only relative to falling wages for high school graduates." "Student debt is a burden for a growing share of young adults." Traditional ways of measuring student debt "fail to consider the changing distribution of debtors over time or the changes in the ways that borrowers repay their loans." When these factors are accounted for, "the data show that many more Americans have debt, and the burden of that debt is more significant now than for previous generations." "Credentialization better explain these dynamics than the 'skills gap.'" Although the nation's population is becoming better educated, "each educational group is becoming less well paid." In the authors' view, this phenomenon "is a result of declining worker power, which allows employers to demand a higher level of educational attainment for any given job, not a broken link between workforce skills and labor market demands." "These trends have had particularly negative impacts on Black and brown Americans." Minorities already have to obtain more education than their peers in order to get the same or similar jobs. In general, people of color have less wealth than nonminorities, which means students of color take on disproportionate amounts of debt, which exacerbates disparities in student-loan debt between minority and nonminority students. Morgan and Steinbaum fortify their arguments with statistical analysis, but this is the essence of what they found. A higher percentage of Americans have student-loan debt than previous generations, and they have more debt than in the past. And this trend has developed at the same time that wages have remained stagnant. As worker power in the job market declines, employers have been able to demand more credentials from job applicants. In essence, employers have been"upskilling" the labor market. I see evidence of this everywhere. Lawyers, for example, need just one professional degree to practice their trade: a J.D. Yet as the job market for attorneys tightens, I see more and more lawyers get additional education: an MBA, for example,or a master's degree in law. But these additional credentials often do not lead to higher salaries--and generally are not necessary for the jobs they are seeking. I give myself as an example of a person who took out student loans to get a credential that did not enhance my job skills. I had a law degree before I became a professor, and my legal skills and experience are all I needed to be a competent education-law professor, a job I have done for 25 years. But to get my first professor's job, I had to have a doctorate, and so I took out loans to get an Ed.D. degree from Harvard. It was a complete waste of time and money. If the only function of that public investment is to increase the credentialization of the labor market and enrich academic institutions that are best able to provide those credentials to students looking to differentiate themselves (at great expense) in a rat race, it's hard to conclude that the public investment s paying off . . . . Indeed, the investment is not paying off. For millions of Americans, the student-loan program is doing nothing more than sentencing them to become members of a permanent debtor class. 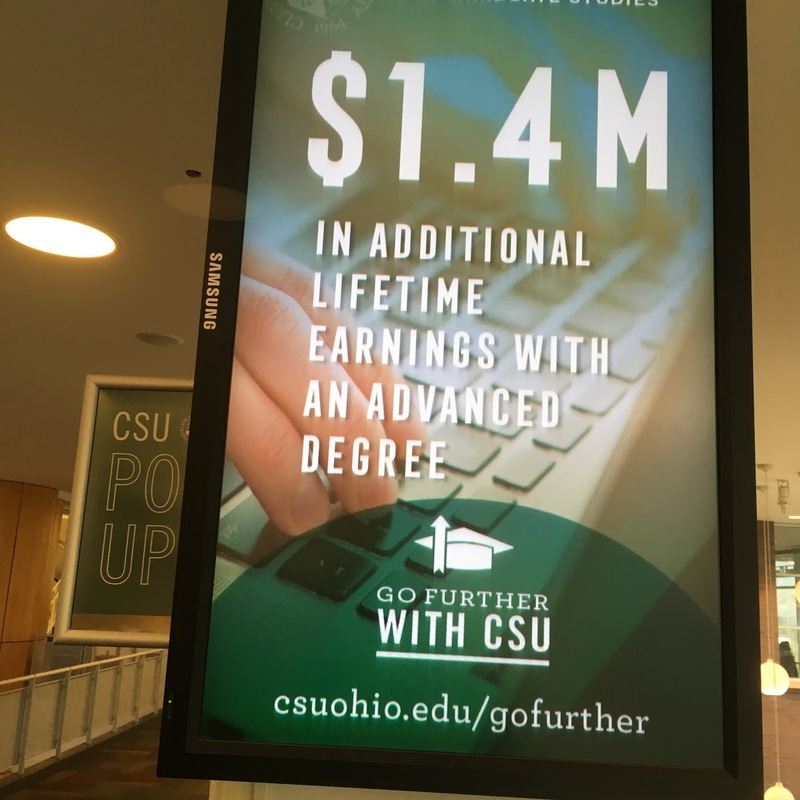 Cleveland State University says you will be richer if you get an advanced degree. Is that true? Jillian Berman. America’s $1.5 trillion student-loan industry is a ‘failed social experiment.’Marketwatch.com,October 18, 2018. Julie Margetta Morgan and Marshall Steinbaum. The Student Debt Crisis, Labor Market Credentialization, and Racial Inequality. Roosevelt Institute, October 2018.